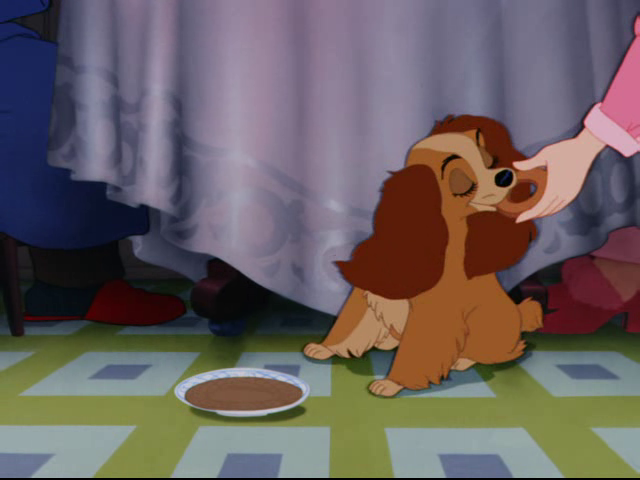 40 Years, 40 Disney Movies: Counting Down to Daddy’s Birthday Night 8 – Lady and the Tramp! Hey-ah. Welcome-ah to-ah tha Disney night-ah. But of course its time for yet another installment of Daddy’s SuperDuperMoviePaLooza. I know. It’s SUPER exciting. Anyways, this week we get to tackle yet another movie that actually lands in my top 5 Disney movies of all time – Lady and the Tramp. 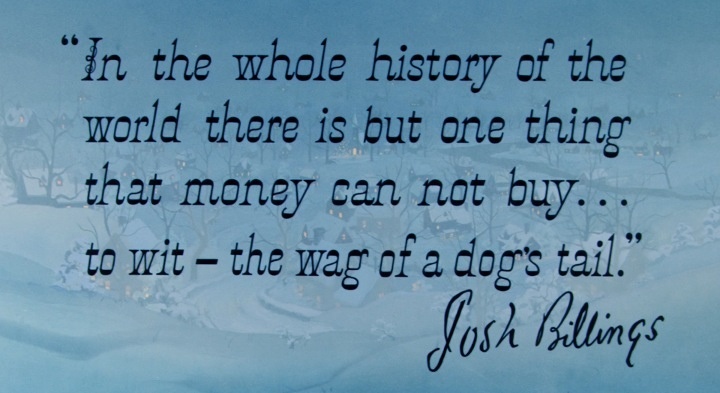 And as all my faithful readers know from my introductory post here, Lady and the Tramp was also the first Disney movie I ever owned. Memories. Light the corners of my mind. Also, when I say faithful readers, I mean reader. And when I say reader, I mean me. Hey me, did you know that Lady and the Tramp was the first movie I/you owned on VHS? Yes, me, I knew that, me. Me, you know me so well. I love me too, you. 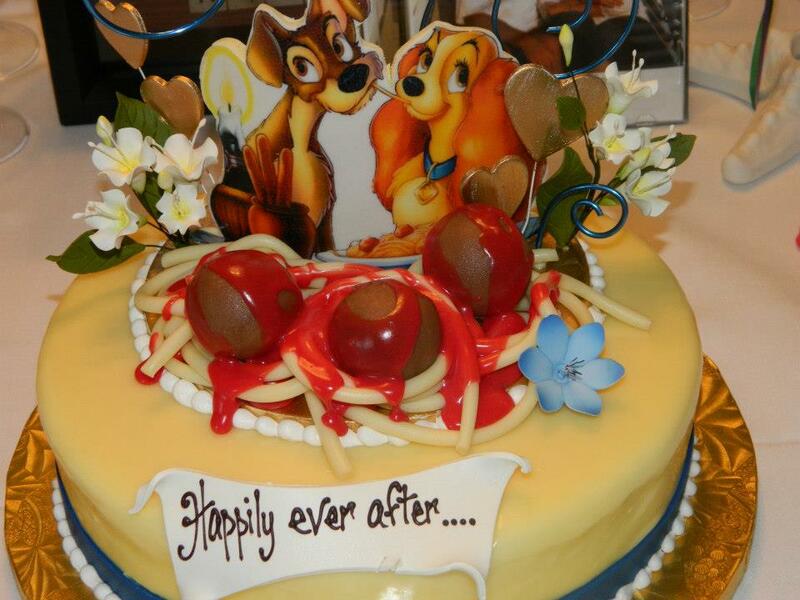 In fact, Nickie and I love Lady and the Tramp so much that when we renewed our vows on our tenth anniversary in Walt Disney World, we had Disney create a special Lady and the Tramp cake just for us. Please note, spaghetti is not actually spaghetti. Also note, meatballs? Not actually meatballs. And dogs? Nope, not actually dogs. On to the night…Tonight, it was the four of us (well five actually…Daisy loves this movie) and of course Steph. It was Friday night so she was obviously free. Myles’ bread stick = very visible. Owen’s bread stick = alarmingly not visible. 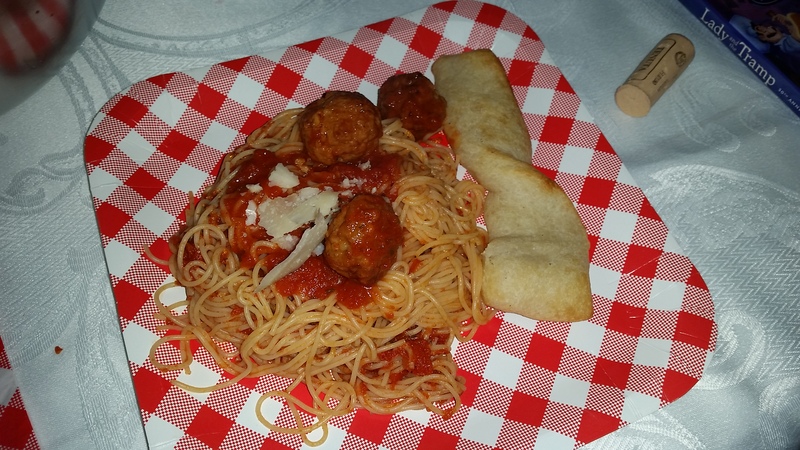 Look, we obviously had spaghetti and meatballs. Duh. 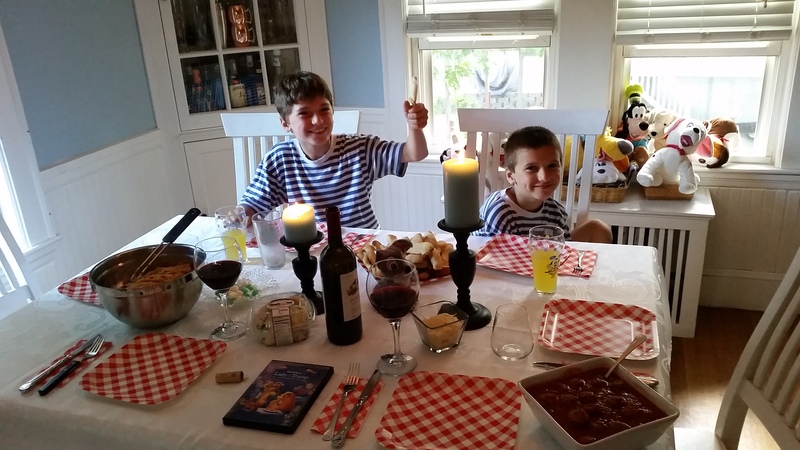 Also, we had some breadsticks and Chianti (well, juice for the pups) as accompaniments. And for dessert, we got some Italian cookies from Toni’s bakery. Well, they were from Market Basket but it said Toni’s on it. Oh anise cookies…you are so delicious. For the activity, we chased chickens. Some fun, hey pidge? 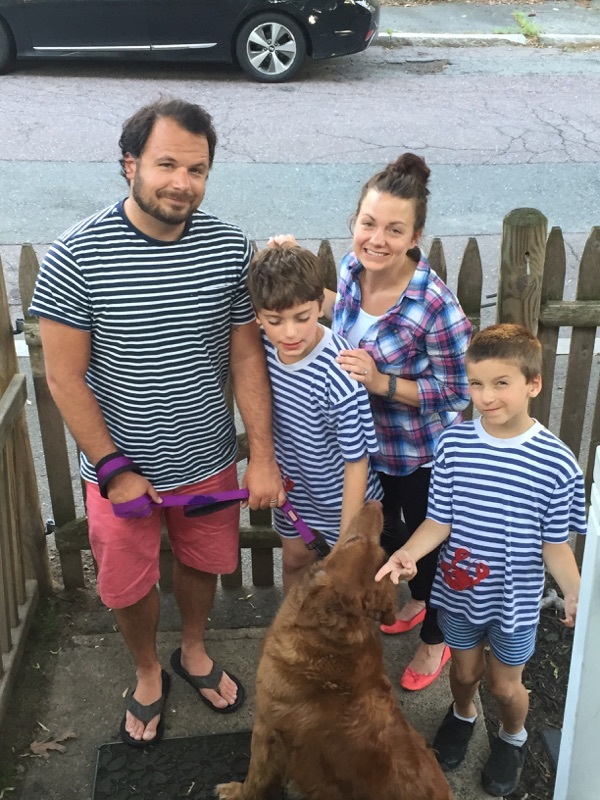 OK, fine…we took Daisy for a walk. Also…I don’t see the appeal of chasing chickens. Oh wait. Now, I get it. But for realsies? We took Daisy for a walk. Actually, eh…more like Daisy took us for a walk. Am I right? Is this thing on? Be sure to tip your waitress. Obviously, the boys and I were just released for good behavior. Or maybe Steph broke us out with her ax. On account of she is a lumberjack. 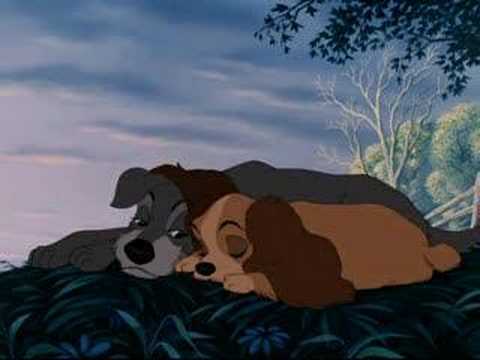 OK, so as I said…Lady and the Tramp. Ranks very high on my list. I mean, I seriously probably can’t be friends with someone that doesn’t like Lady and the Tramp. That’s not true. I need all the friends I can get. Well…erm, I don’t actually know what that means but still. Dogs, amiright? But beyond the awesomeness of dogs, there is so much more to love about this one. And I am going to list some of them for you here, right now. They were obvs REALLY into that song to not have noticed this was going to happen. This movie is like Titanic. Except with more dogs. And less drowning. The rich, pampered Lady meets the scruffy yet slightly misunderstood Tramp. I mean, Lady is seriously pampered. Like, doughnuts and coffee pampered. Rumor has it this movie led to a spike in dog obesity levels. But regardless, these two are obviously from different worlds and yet, they fall in love despite it all. Despite those around them that say it the other is no good. Or the danger that might befall them. Despite it all, you love who you love right? And who can’t get behind a message like that? Obviously, Tony and Joe are into it since they go through the trouble of setting a table and playing an accordion. The Siamese cats – I know there are cats out there reading this blog that are like, “Hey those cats give us a bad name.” And to those cats out there saying that, I say to you…that’s so awesome that you can read. But seriously, these cats are pretty great. I laugh every time I hear, “where we finding baby, there are milk nearby.” It’s impossible not to. The supporting canines – Jock. Trusty. Peg. Pedro. The frakkin beaver? All amazing. Jock and Trusty really serve up a great deal of the heart in this movie. I mean, when they propose marriage? 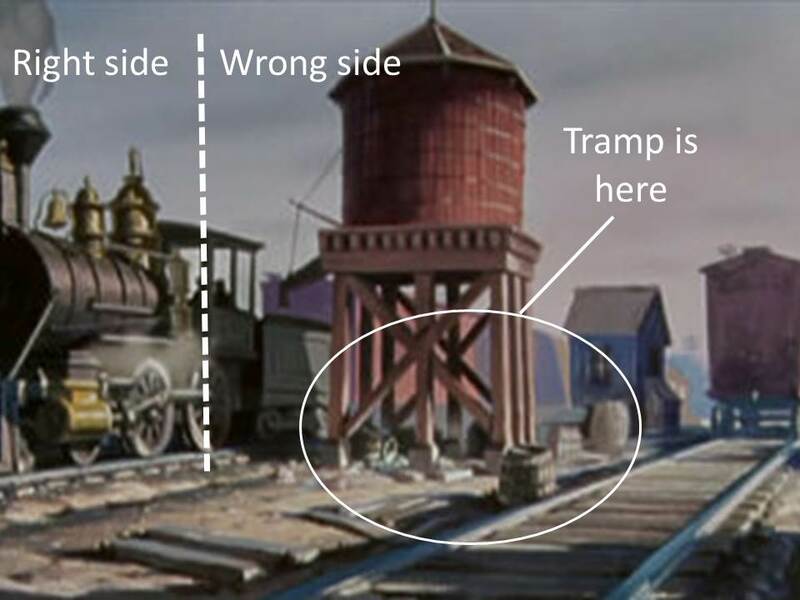 Or when Jock sits at the still body of Trusty after the carriage tips over? For. Get. It. Spoiler alert though – Trusty is ok. THANK GOD. Next postIs Pixar’s Inside Out amazepantz? Uhm, Yah. Thanks Layne! 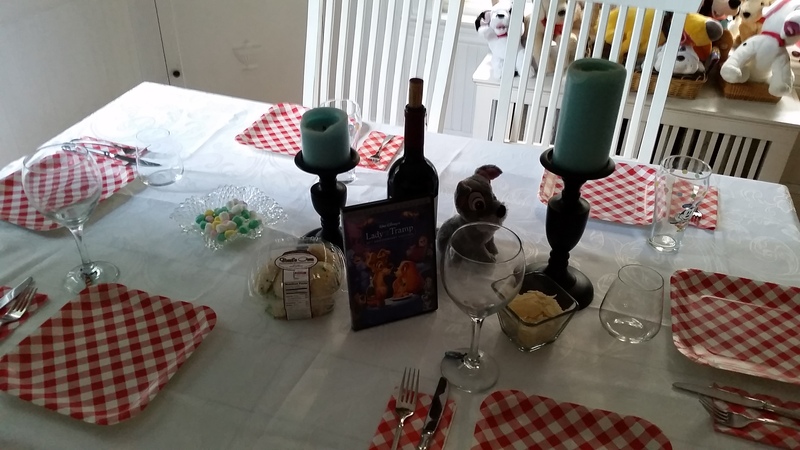 Glad you liked it….And yeah, Lady and the Tramp is bomb. Obviously.